If you’ve read my article”Number 1 mistake of retail owners“, then you understand how important it is to start building a email marketing mailing list for your retail business. You haven’t read it? Go read it now on the link above! List building makes more sense after that article as a pretext. Building a mailing list without an online product is much slower, and harder. This is the case for most brick and mortar business owners. Your business is not as accessible as a e-commerce product, that can literally be seen and bought anywhere on Earth. However the upside is that the leads that you do generate from your retail outlet are high quality leads, with very high conversion rates when properly sold to. Remember, the best repeat customers are customers who have bought your product before, and are not only familiar/satisfied with your brand and are ready to buy again. This is why collecting leads for your list at your physical site itself is very important. Every lead you get there is a high potential recurring client. So how do we go about building our email marketing list? A lot of restaurant or retail owners have found it hard to collect, as customers do not provide their information readily. Well, DUH! Why would anyone give his personal information for free? But the first barrier, is actually to just ASK. So after asking, let’s go into the tips and tricks of increasing your success rate of list building. Dr. Ellen Langer, a Ph.d psychologist at New York University, conducted the ‘Copy Machine study’ which found that by just providing any reason, your request will increase by 35% compared to asking without a reason. In fact, it doesn’t even have to be a good reason! You not only want an email address and a name, but try to get occupation, birthday, living address and mobile number, in fact, as much details as possible. Why? Because with all these details you can start to slice your list and segment them. Tailor messages to different groups for higher response rates, and sieve out redundant contacts. When using certain technologies like SMS services, every message is a cost, so you don’t want to be spending money sending promotions to insurance or real estate agents who are trying to pitch you their business, not give business. Recognize what is important details to your business, for example in the restaurant business, living or company address is most critical in determining how often your prospect will come back; If they stay or work nearby your establishment, they are highly likely to become repeat customers. Also, you can opt to use direct mail with their address. Knowing customer’s critical dates like birthdays or even wedding anniversaries will allow you to send themed offers and ideas on where to celebrate their occasion: your restaurant. When collecting lists online, it’s really simple during data collation because everything is digital and input by the customer, going directly to a preset list. Minimal effort to sort and organize. The problem with most retail outlets is that they collect lists using pen and paper. The pros is that it’s cheap and easy to administer, however when you have 500 emails and names to key in at the end of the month, the nightmare starts. Also, I’ve lost a small number contacts purely because the hand written email/number resembles indecipherable chicken scratchings. Whenever possible, direct users to a digital signup form. This minimizes typos, unreadable writing and forces them to fill every field you deem compulsory. However, you can’t just give them a link and expect them to respond by themselves, as once procrastination sets in you’ll lose your lead. It has to be immediate and on impulse. One way is to open and configure a sign up form on a tablet like an iPad, then just hand it to your customer at the outlet to fill in. This is effective for low to medium volume transactions, as you don’t want to spend too much money on tablets for multiple simultaneous sign ups. If your business however is high volume or prone to having your gadgets stolen, you can still stick to pen and paper. Here’s how I do it for my milkshake business. Not the most elegant, but it works. Data entry however, is a b*tch because I collect around 150 emails/numbers a week, and have to key them in the computer. At the start I used to enter the data myself, but eventually I’ve switched to just paying someone to enter the data. Much more efficient use of time, which is an option you can consider. Your customers might even WANT to join your list, but are not aware of it. 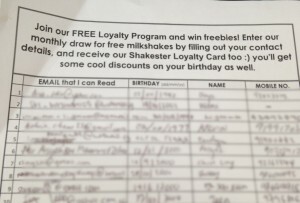 Initially, I kept the list within the store and had my staff ask customers in each transaction whether they would like to join our membership list. 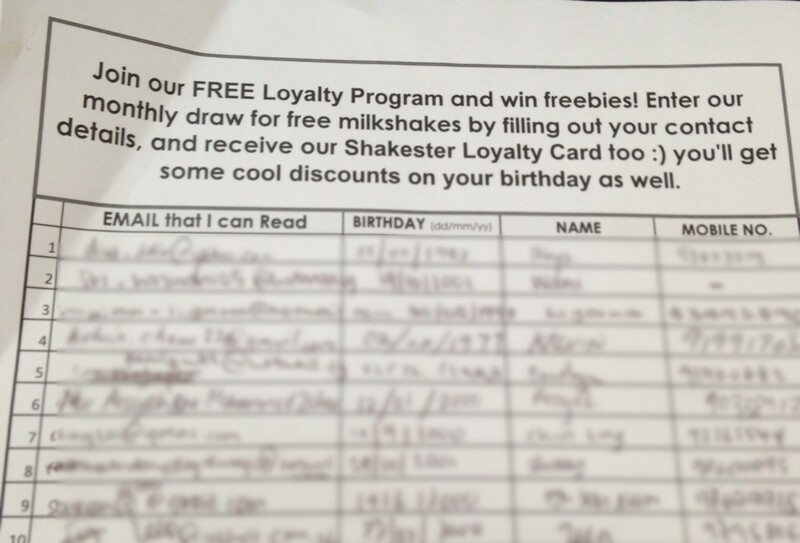 The staff would bring out the list and ask customers to sign up when it was not very busy, or if they remembered. One day however, I tested just leaving the signup list at the cashier counter, with a pen, for customers to see and write themselves. My staff would just point to it after a sale. My collection rate doubled with just this simple switch. The reason is probably with getting higher list visible exposure, as well as being less aggressive in collection. Customers feel like they ‘discovered’ a membership program themselves, and are more open to joining. So make sure every single customer is aware you have a list program, and can easily access it. In addition, by showing that many other people before have signed up to this list, it takes away the fear and gives your business social proof, thus more easily convincing more signups. Society is full of followers who will follow the majority.